I have been working for an oil company in Kansas USA for the past three months marking out remotely oil fields and oil pools in various areas in Kansas. This gives them a guide to the depth and quantities recoverable and the gravity weight of the oil. This will be followed up in due course with an on site survey confirming the exact location the same as previous sites I have remotely worked on in the past. This company used me as an consultant to confirm their suspicions/findings were correct. They have confirmed to me recently that my findings are the same as theirs. 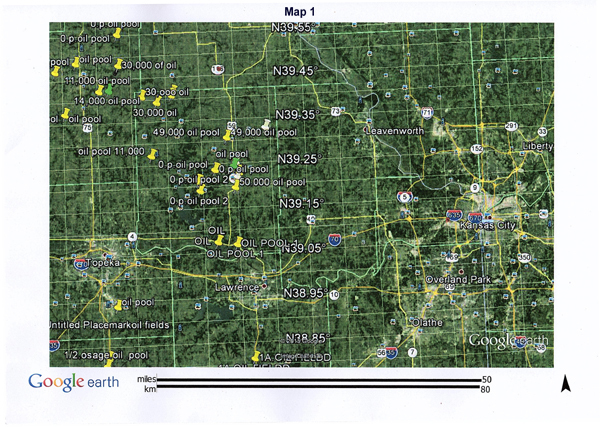 These oil pools quoted below are separate and are not included on my world list of oil field locations. First stage starts from 50 miles out showing the locations of oil pools in part of Western Kansas. 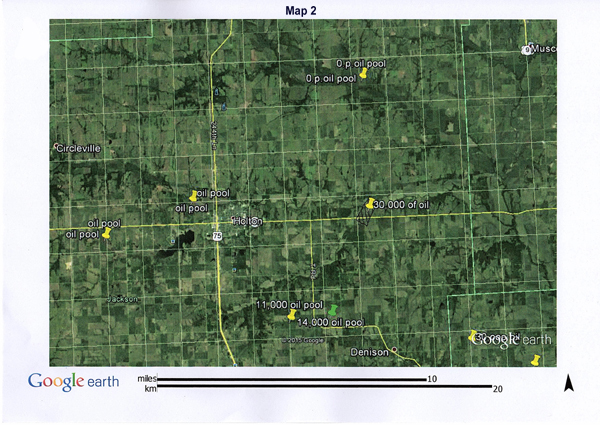 The particular locations marked out I have done for clients in Kansas. As you will see from this google earth map, the quantities of oil recoverable vary considerably, apparently 50,000 barrels recoverable is financially feasible in that County, whereas in places such as the UK we look at potential oil fields of at least 2 million to 3 million barrels recoverable. Of course in that part of Kansas the fields are also shallower which makes them cheaper to drill for whereas in the UK they tend to be deeper. An important thing we have to look for in that part of Kansas is the gravity because of it being shallow we have to watch out that it is not too heavy or too think otherwise it will be almost impossible to release from the strata. 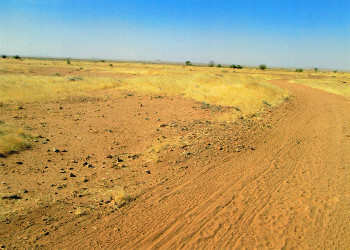 Map 2 is taken from 10 miles distance showing less oil pools. The one to look for is the 30,000 barrels recoverable marked out by a hatched area with a yellow marker. 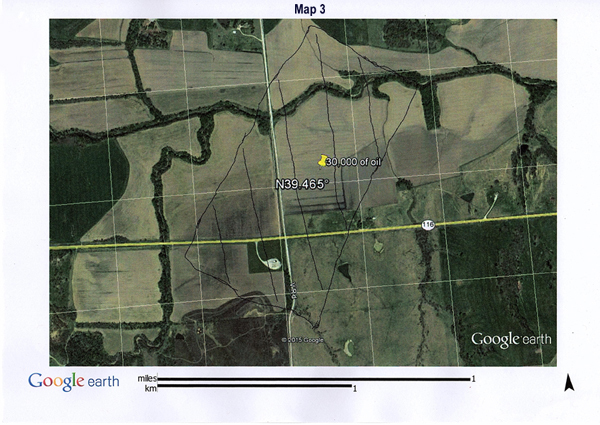 Map 3 shows the client the location of the oil pool hatched out for the client at a distance of 1 mile. At this stage the client is given a guide on the depth of the oil, the quantity recoverable and the gravity of the oil and the ferocity of the rock. What I have found is when the client does their own research on these areas they then confirm my findings. After this stage the client will then decide whether or not they need me to confirm my findings by asking me to visit the site in question to firm everything up and also to then compare our results. Once it is confirmed on site that the findings tally it can then go to the next stage of actually drilling the site in question. This will increase the success of the project for the client. Many clients are seeing this as the cheapest and best way forward as my clients in Kansas have seen it that way.